Mineral nutrients are essential for plants where they play specific metabolic functions. Macronutrients are required in higher quantities, while micronutrients in smaller amounts. Deprivation or paucity of any macro- or microelement has negative effects on plant development and yield, potentially impairing the plant capability of reaching and completing the reproductive phase. Therefore, the evolution of mechanisms able to maintain the tissue mineral nutrient homeostasis in response to changes in their availability in the growth substrate is a key factor under both the evolutionary (biological) and agricultural (yield performance) points of view. The supply/availability/plant intake and assimilation of mineral nutrients are often limited by extrinsic (i.e., environmental) and intrinsic (developmental, biochemical, physiological), plant-related factors. Since all of the latter are under genetic control, use of efficient plant breeding procedures for improving the complex trait of plant nutrient utilization efficiency is of paramount importance. This issue is made more compelling since intensive agriculture, necessary to satisfy the increasing food demand on Earth’s scale, requires, in order to reintroduce into the soil the mineral nutrients removed with plant harvest, the use of large amounts of fertilizers posing serious soil, air and water pollution concerns. Nitrogen, with phosphorus and potassium, is the macronutrient that more deeply affects crop production. 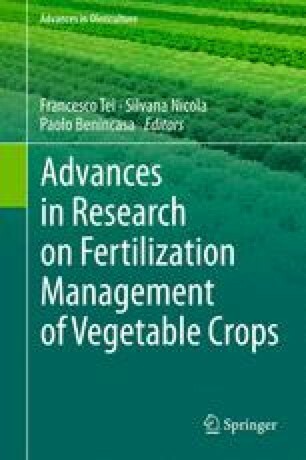 The chapter presents a survey of the main molecular aspects determining the biochemical and physiological bottlenecks that limit Nutrient/Nitrogen Use Efficiency (Nu/NUE) in crop plants, with particular focus on leafy vegetables. The most innovative molecular approaches applicable to overcome these restraints, based upon the use of novel genome- and transcriptome-based technologies, are reviewed.